Winnipeg needs a 24-hour intake facility for methamphetamine users, more housing for people recovering from meth addiction and better mental-health care, MPs on the House of Commons health committee were told in a face-to-face meeting with men in various stages of substance-use recovery. 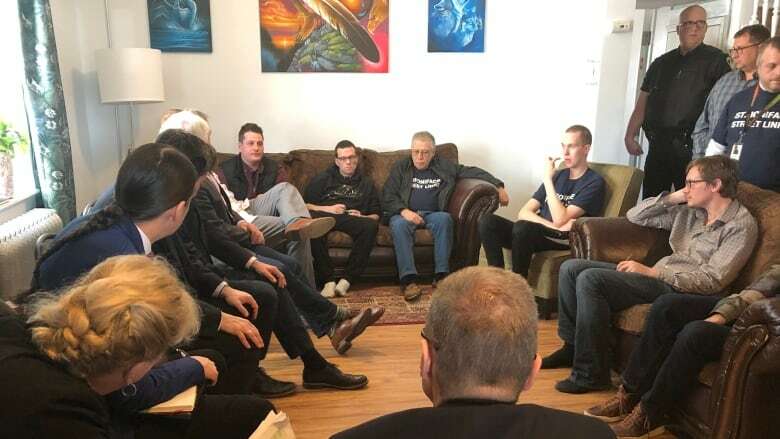 Liberal, Conservative and New Democratic MPs spent two hours on Tuesday morning meeting in St. Boniface with residents, former residents and staff at Morberg House, a 12-bed transitional home for men recovering from addictions. "Governments for so long have lived in silos and they really don't do any cross-department planning," Morberg House director Marion Willis told committee members, who included Winnipeg Liberal MPs Doug Eyolfson and Robert-Falcon Ouellette. "You can't just address homelessness. You can't just address addictions. You can't separate out mental health. These things are intertwined." Willis and Winnipeg police officer Tim Diack, who mounted a mayoral campaign last fall, told the MPs it makes no sense to spend resources on a safe-injection site in Winnipeg when methamphetamine users would not benefit from such a facility. Willis said various levels of government could better serve the city by creating a four-storey methamphetamine intake facility that could deal with patients undergoing meth psychosis 24 hours a day, seven days a week. She also described a city-provincial task force on methamphetamine use as a waste of time when workers on the front line have already identified Winnipeg's immediate needs. Morberg House residents told the MPs existing addictions-treatment programs fail methamphetamine patients because 28-day residencies are too short to affect meaningful change. They also complained of the inability of hospitals to deal with patients in crisis, restrictions that prevent patients at risk of homelessness from getting access to stable housing and the shortage of facilities such as Morberg House, which operates on a $600,000 annual budget without government subsidies. "If you could just replicate this model throughout the city," said Robert Lidstone, a former Morberg House resident who now sits on the board of the facility. Health committee vice-chair Don Davies, the NDP MP for Vancouver-Kingsway, said what he heard cemented his belief addiction must be treated more from a mental-health perspective than from a criminal-justice perspective. Fellow vice-chair Marilyn Gladu, the Conservative MP for the Ontario riding of Sarnia-Lambton, said federal Liberal addictions-treatment policies are failing. Canada faces a federal election in October.